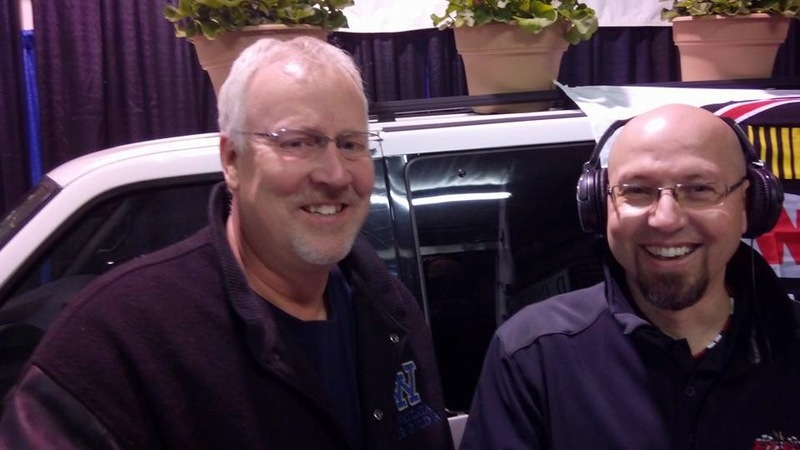 2014 Marked the 6th season of covering Motorsports on KRWC for Jason and Dean. 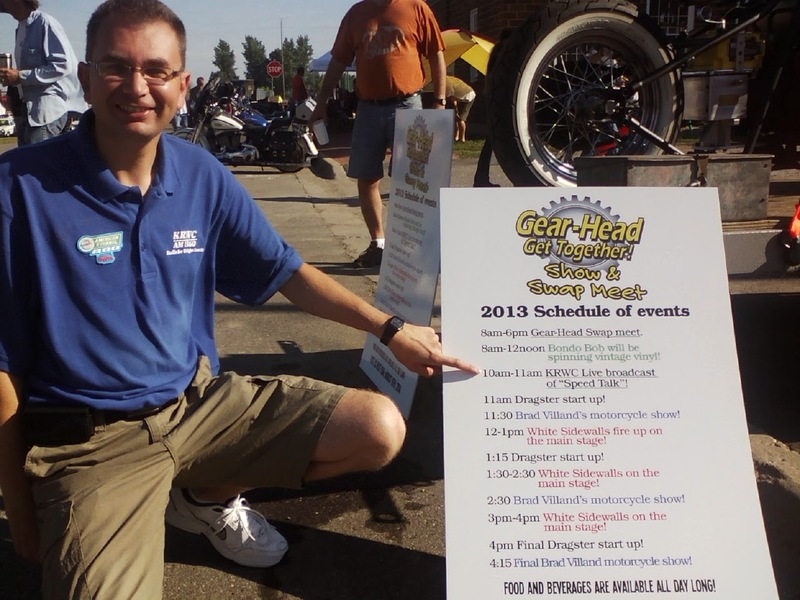 We reported on many great races in the Upper Midwest from Iowa Speedway to Elko Speedway and Brainerd International Raceway. 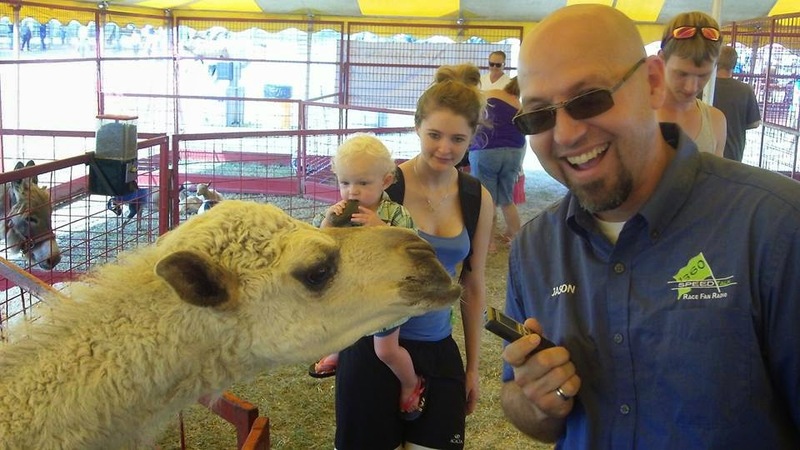 We also broadcast live from lots of interesting venues including the Gear Head Get Together in Maple Lake, the Classics by the Lake Car show in Buffalo and the Mud Spectacular at the Wright County Fair. We were able to interview 67 different drivers this year, we love to hear the emotion in their voice from telling their story in their own words. It would not be possible to do this show without these sponsors, please support them in the same way they support local racing. 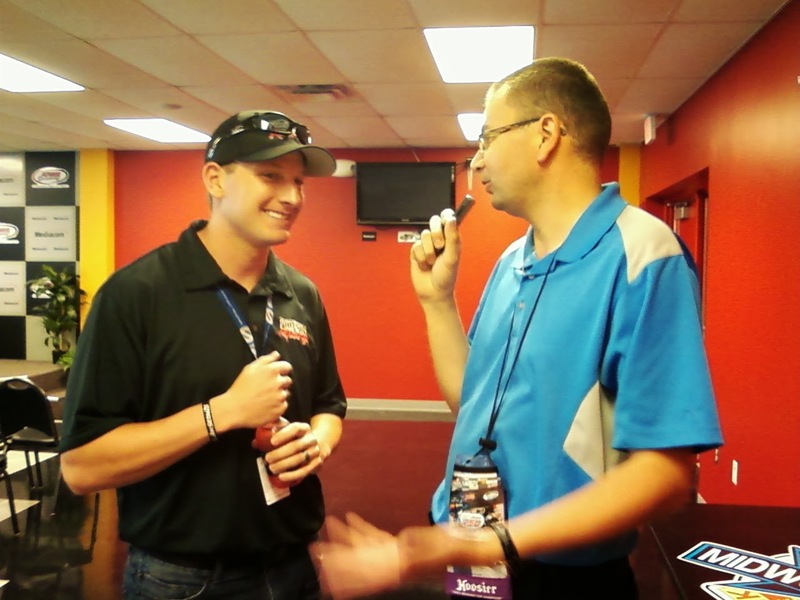 We were able to Pod-cast many of the interviews done on Speed Talk radio. Here are links to the Top 10 interviews done in 2014. 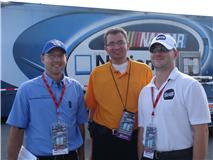 Also, a big Thank You to our two weekly guests: Jordan Bianchi from SBNation.com/NASCAR for his awesome NASCAR coverage and Dan Plan from TheRacingConnection.com for his local racing knowledge. 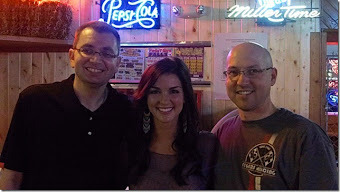 Thank you race fans for listening to our show, we plan on being back on the air in April 2015! The Champions banquet wrapped up the 49th season of racing at Elko Speedway. It was interesting looking at some of the 2014 season ending facts and numbers. 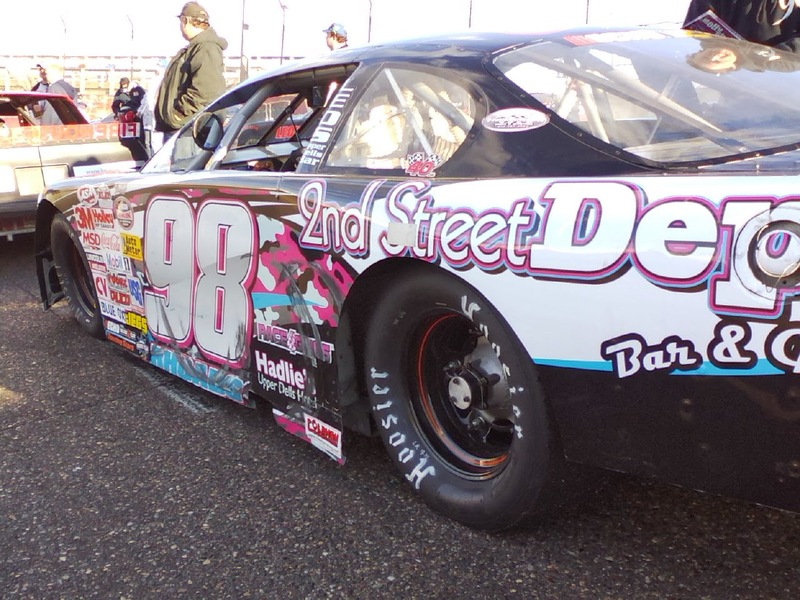 We saw nine different winners in the Super Late Model division, Jacob Goede won the point title, the driver of the year and seven races, but Paul Paine had an incredible year finishing second and was very consistent but had no wins. 1976 Elko Point Champion Mark Lamoreaux won a race early in the season and Kyle Hansen finished 9th in points and received the Rookie of the Year award. Jacob Goede (photo above) was very emotional in his victory speech and had to pause to gather his emotions at one point. 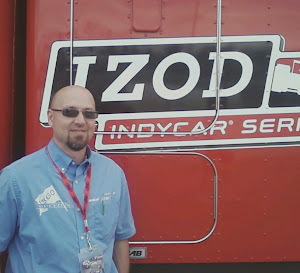 He said "the decision to come back home to Elko was easy, I learned that racing is not as much fun if you're not doing it with people that you love." He mentioned to me many times during the year it was really nice to race against his brother and with his young and expanding family nearby. Ten different drivers won races in the Big 8 division, proving that the cars were evenly matched and nearly anyone could win on a given night. Chris Marek won the point title and five races, three in a row at the beginning of the season. Jon Lemke closed the gap in the points late in the year finishing second, Michael Beamish was much improved and finished the season third in points in addition to winning the Oktoberfest race. 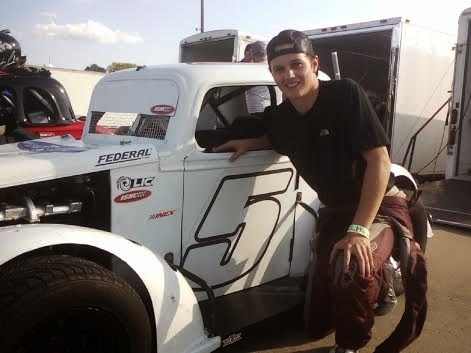 Rookie Cole Anderson turned some heads with his two wins and four "fast times" in qualifying, more than any other driver, he also received the Rookie of the Year award. 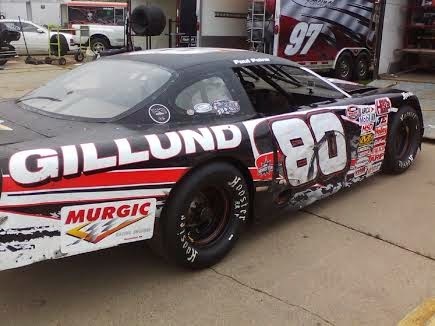 Conrad Jorgenson won the Thunder Car title his fourth Championship at Elko Speedway. 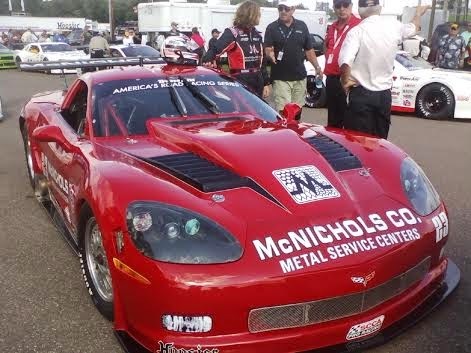 He has now won in the Thunder Cars in 1995, 2003 and 2014, he also won the Super Truck Championship in 1997. Only 5 different drivers won races this year with Brent Kane getting 8 victories but finishing fourth in points because he missed a race night mid-season to be in a family wedding. Jack Purcell finished 10th in points and won the Rookie of the Year award. The Great North Legends title was won by Derek Lemke (photo above), he scored three wins during the season in the Legends and one in the Super Late Models. Brady Fox-Rhode finished second in points and won the "Most Improved Driver" award, he moved up from 7th in points last year to 2nd in 2014. 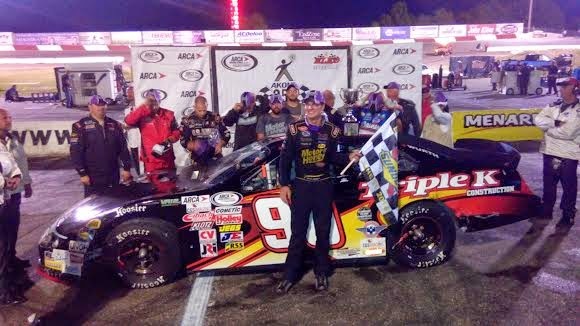 He also scored a win at Elko Speedway, Hawkeye Downs and the Dells in addition to winning the "race of Champions" in the Asphalt National Championships at the Bull Ring at Las Vegas Motor Speedway. Eight different drivers scored a win this year, Tim Brockhouse lead the way with 4 wins racing part-time and Jared Duda won Rookie of the Year. The Power Stock division was arguably the most entertaining division all year long at Elko Speedway. Nick Oxborough won the Championship in his rookie season at the track, he scored three important wins, very crucial because they were the determining factor when he tied with Grant Brown for the points Championship. Brown finished runner-up in the Championship but he won the UNOH Youth Achievement Award, what he accomplished at the age of 14 was astounding. Ten different drivers won races in the Power Stock division and the 20+ car count every race night was very encouraging for the future of that division. Brian Adams won the Mini Stock title with six wins, Michael Wachs Jr and Brandon Plekkenpol tied for second with Wachs getting the tie breaker with his two wins. Eight different drivers won in the Mini Stock division and Collin Neisus won Rookie of the Year. Brody Wulf won in the Bandoleros, he had four wins and Owin Giles had five wins and finished second in points. This division is very important to Elko Speedway to keep talented young drivers here, a good transition from the "little Elko" 1/4 midget track to racing in front of the big crowds at the big track. 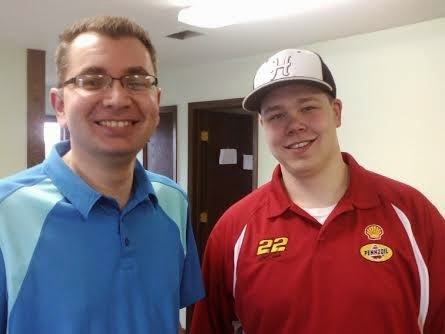 Power Stock driver Grant Brown won the Bandolero Championship in 2012 and Great North Legend driver Jared Duda won in 2013, they are both moving up the ranks and continuing their racing careers at Elko Speedway. 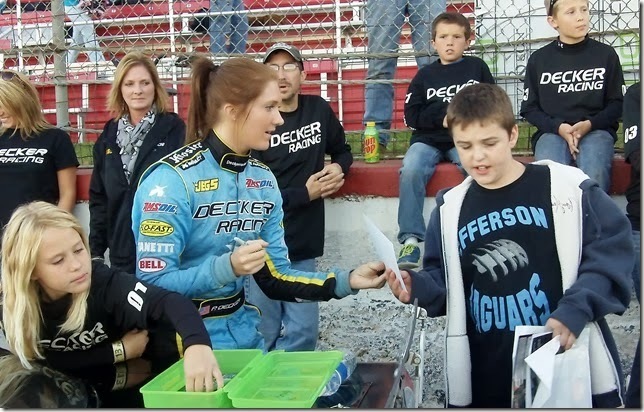 The Nick Beaver race team won the Elko Speedway Goodwill award for their efforts in helping Rylie (photo above), a young autistic girl become their biggest fan. They made her part of the team and gave her the trophy after a big win. 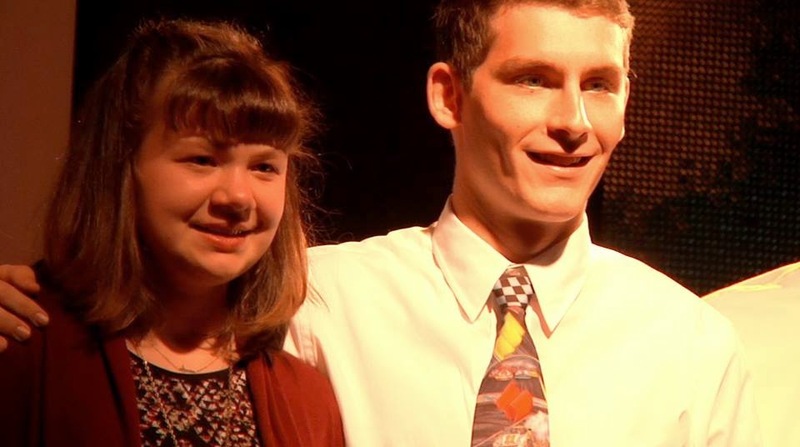 Their compassion touched many people in the audience and they got a standing ovation at the conclusion of the program when Rylie and the Beaver team came up to accept the award. Now that 2014 is wrapped up time to recharge our batteries and look ahead to next year, the 50th season of racing at Elko Speedway. 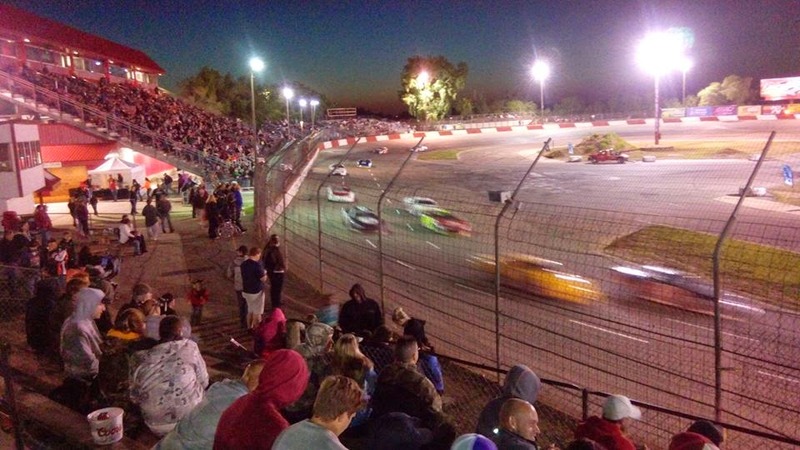 The 2014 Power Stock division provided excitement, and action on a weekly basis at Elko Speedway. The finale of the Power Stock season did not disappoint fans looking for drama as two rookies battled for the Championship. 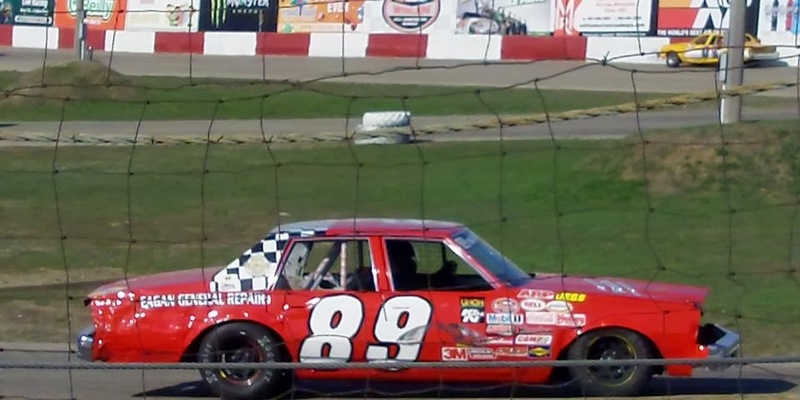 Coming into the final night, #88 Nick Oxborough was the leader, he had lead most of the season and picked up three wins in his rookie season at Elko Speedway. 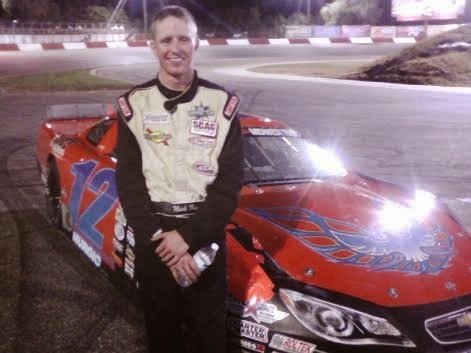 He lead #14 Grant Brown by 4pts, Grant is the son of four time Sportsman/Big 8 Champion Doug Brown. 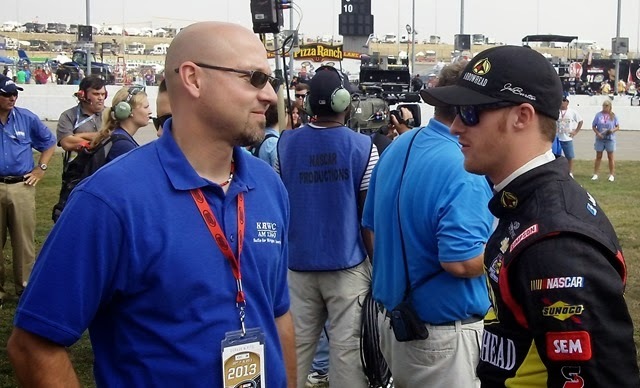 Before the races I talked to Doug about Grant, he said he was proud no matter what happens, he also said his advice to his 14 yr old son would be, "drive it like you stole it." The heat race saw the two competitors race in the same heat with Brown finishing just ahead of Oxborough and knocking the margin down to two points. A huge field of 24 cars started the feature event, the winner of the race gets 51 points, 2nd place 49 and then it goes down by one point per position after that. Nick Oxborough started third row outside and Grant Brown began the race directly behind him knowing not only he would have to pass his rival but either he would have to win or finish more than one position ahead because Oxborough held the tie breaker with those three wins. 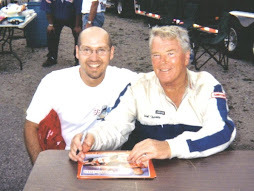 Veteran racer Tom Quade held the early lead then Dusty Mann driving the Ricky Martin car that won all those figure 8 championships at Raceway Park stuck to the bottom and took over on lap 6 of the 20 lap shootout, he would later win the race. The racing up front was exciting but the drama was the battle for the Championship as Oxborough was in 5th and Brown got pushed back to 8th. Both drivers narrowly avoided disaster during the race, the action was wild just in front of Oxborough as Taylor Goldman had contact and spun coming into corner number four then on the restart Shawn Prins was bumped and did a 360 right in front of the entire field. Brown took advantage on the inside and passed Oxborough for the third position but time was running out, he needed help and got it from Paul Hamilton who passed Oxborough dropping him back to fifth meaning they were tied for points on the white flag lap. Brown was two car lengths behind Cole Neisius for second, Neisius slipped and Brown got to his back bumper right as they crossed the stripe. Oxborough held on the finish two positions behind Brown securing the Points Championship by the most narrow of margains. After a full year of racing both drivers tied with 922 points, Oxborough won the Championship on a tie-breaker due to his 3 wins during the season. Oxborough was thrilled to win in his rookie year, thanked his family and crew and vowed to come back next year to defend his Championship. Brown went on Facebook after the races and posted this "Well, I had a lot of fun this year. My guys did a great job giving me the best car I have ever had. Ended up tying for championship win, but I lost the tiebreaker due to my amount of feature wins. But I still had a great time, and to me that is worth a lot more than a trophy." Well said for anyone, let alone a 14 yr old. Grant Brown surpassed the expectations of everyone in his rookie season, he was super strong and consistent he finished 2nd five times, well make that five runner-ups and one tie for a Championship. From beginning to end racing in the 2014 Power Stocks division was one we won't soon forget. 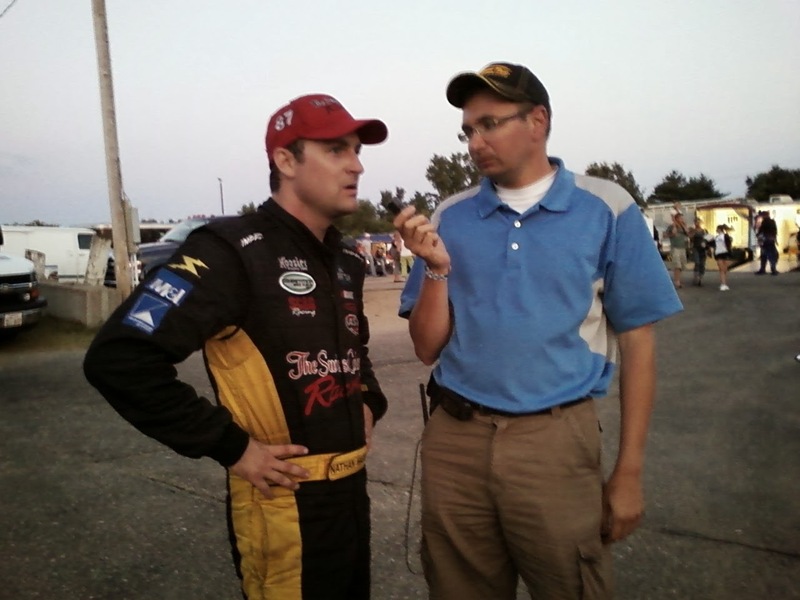 Dan Fredrickson from Lakeville (MN) was the class of the field on a stormy night in the ARCA Midwest tour Thunderstruck93 event presented by NAPA Auto Parts at Elko Speedway. 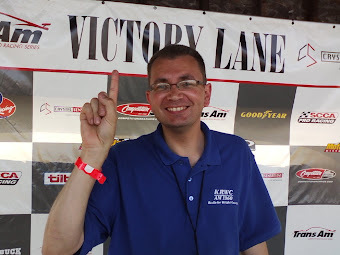 The 6th annual Thunderstruck event is in memory of Elko Speedway Hall of Fame member Dan Ryan who died of ALS. 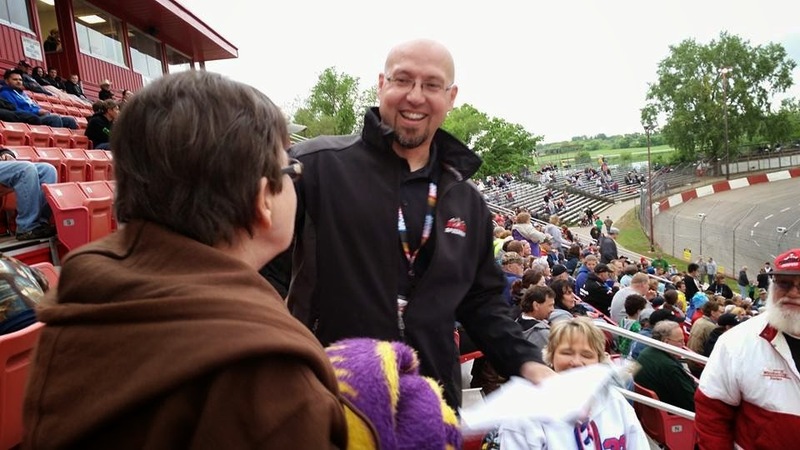 To Dan Fredrickson this race has special meaning "my buddy Dan died of Lou Gehrig's disease, its really a tough deal to experience and I think about him a lot," said Fredrickson who has now won 4 of the 6 Thunderstruck93 races and its trademark guitar trophy. 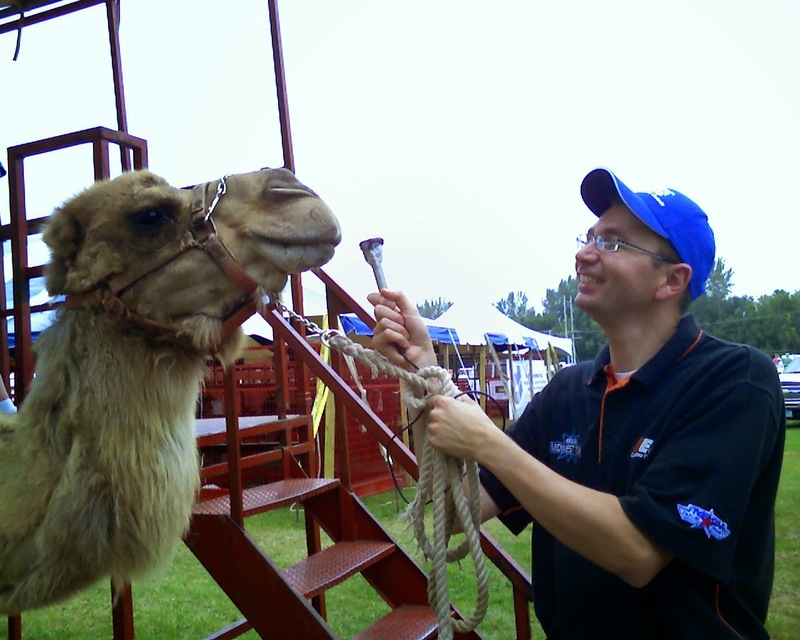 Fredrickson is both a former Elko Speedway track Champion in 2003 and two time ARCA Midwest tour champion in 2008 and 2013. 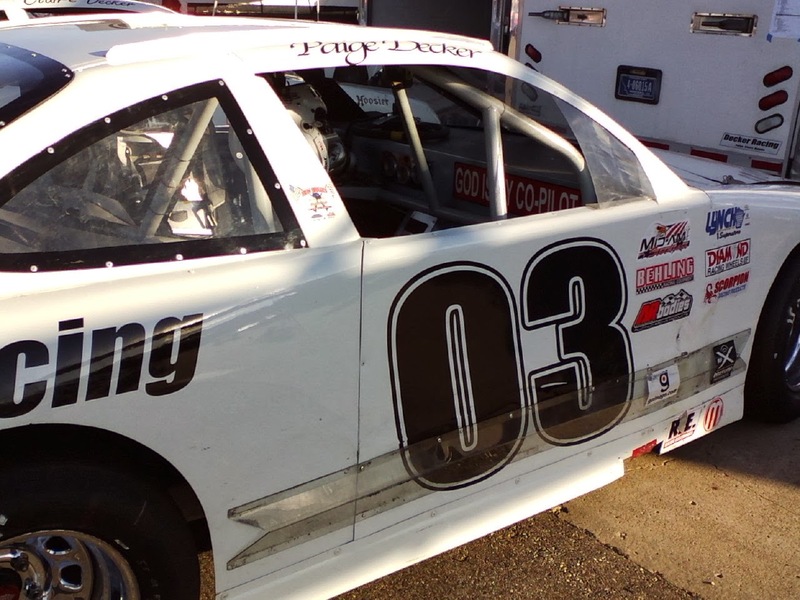 Dan took most of this year off from racing but came back to racing at Elko Speedway a few weeks ago to get his car ready for Thunderstruck93. 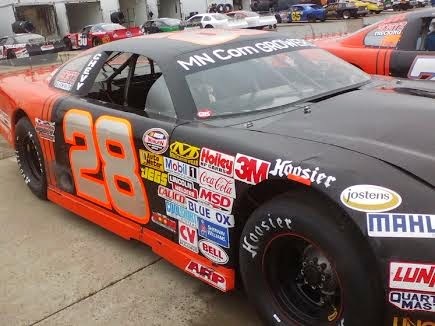 "It payed off," said Fredrickson "the car was pretty good, much better than last year." Fredrickson was fastest of the 32 cars in Time Trials with a time of 13.700 but the 12 car inversion for the 125 lap feature after a short rain delay put him back in the 6th row to begin the race. Brad Keith from West Bend (WI) lead the race early but fell back after Hampton (MN) driver Jonathan Eilen shot to the lead on lap 6. Fredrickson passed Eilen on lap 24 and never gave up the lead even though he got loads of pressure late in the race from Ty Majeski from Seymore (WI). "We thought it might rain, so I worked my tires a bit too hard early in the race" said Fredrickson. 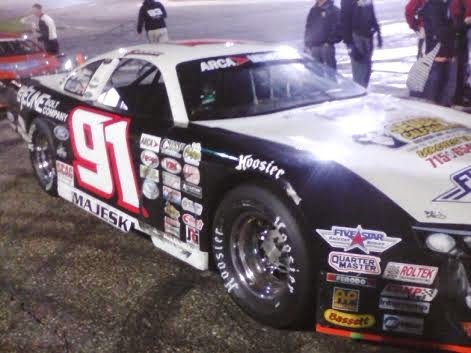 Majeski who was 2nd in ARCA Midwest tour points moved to second on the track by lap 100 and raced side by side with Fredrickson for the lead the rest of the race "I gave him the bottom a couple times, I was nervous that I might miss a corner here or there, but it was a really good race," said Fredrickson. 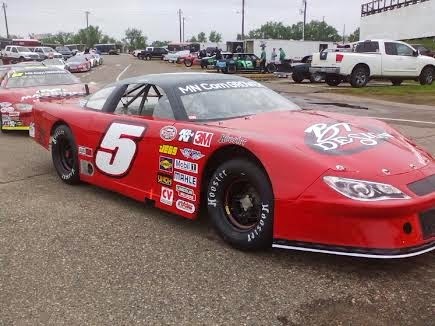 ARCA Midwest tour point leader Nathan Haseleu from Marshall (WI) finished 4th and Elko Speedway MN Corn Growers Super Late Model Champion Jacob Goede from Carver (MN) rounded out the top 5. Veteran racer Tim Sauter 6th, TUNDRA Champion Nick Panitzke 7th, Jason Weinkauf 8th, Chris Weinkauf 9th and MN Driver Joel Theisen got his first ever Midwest Tour Top 10 finish. 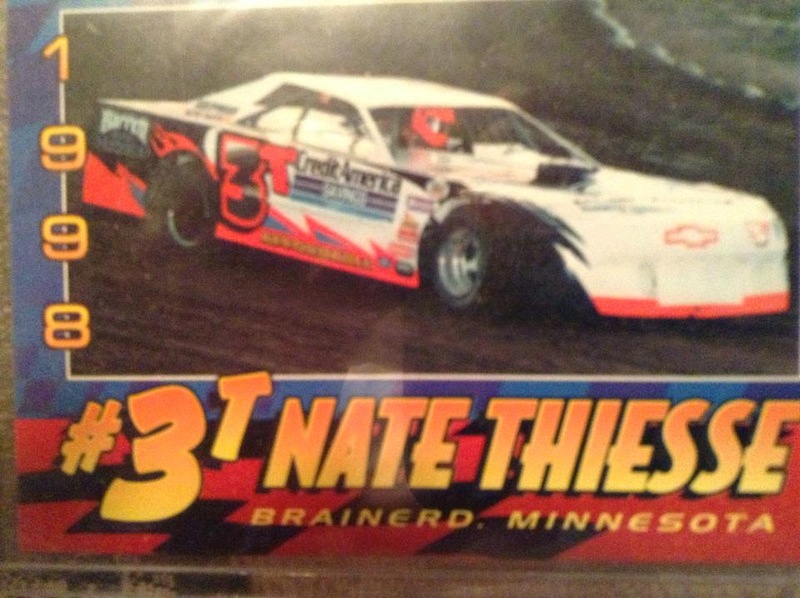 The Big 8 Late Model series appeared in Minnesota for only the second time ever at Thunderstruck93 and it was 18 year old Austin Nason from Roscoe (IL) who won. Nason started the 58 lap race 10th but worked his was to the lead by lap 18, he passed Joe Neisius from Rosemount (MN) on the high side for the top spot. Nason then had to hold off Elko Speedway Big 8 Champion Chris Marek and then Big 8 point leader Casey Johnson from Edgerton (WI) for the win. Nason won by only .203 seconds at the finish line with Johnson 2nd, Marek 3rd another Minnesota driver Jon Lemke in fourth and Neisus dropped to 5th in the 24 car field. 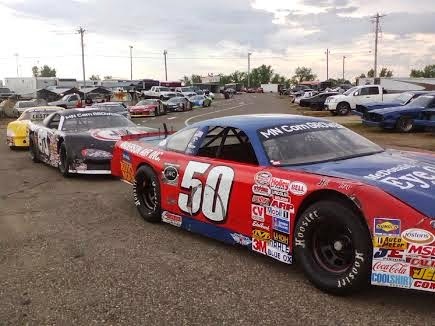 The 11th annual Genz-Ryan Thunder Car Nationals race also took place at Elko Speedway during Thunderstruck93. It was Dillion Sellner from Farmington (MN) leading the 25 car field the entire 50 lap race. Sellner was challenged numerous times during the race by Ted Reuvers from Dundas (MN) and then it was Tina Davis from Rosemount (MN) putting on the pressure late, Sellner won by .240 seconds. 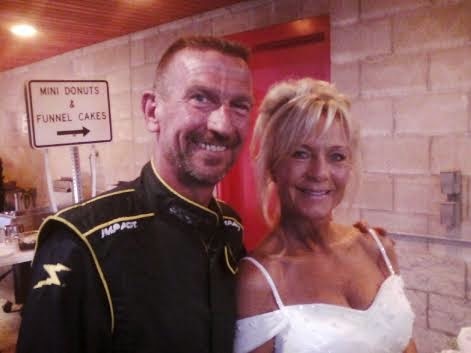 Scott King finished 13th, he and his bride Tracy (Photo below) were married at the track just before opening ceremonies. Tim Brockhouse from Prior Lake (MN) won the 20 lap Great North Legends main event, he had a furious battle with Dirk Henry from Sauk Centre (MN) as the two went side by side for much of the race, swapping the top spot. 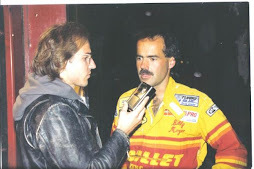 "It was really cool, Dirk and I must have rubbed 7 or 8 times, he raced me clean though and we didn't crash and he was the first one to shake my hand in victory lane," said Brockhouse. Point leader Derek Lemke from Shakopee (MN) broke a gear mid-race and finished 15th in the 19 car field, Brady Fox-Rhode finished 8th and closed the gap in the point standings. Lemke has only an 8 point lead over Fox-Rhode going into the final race night. 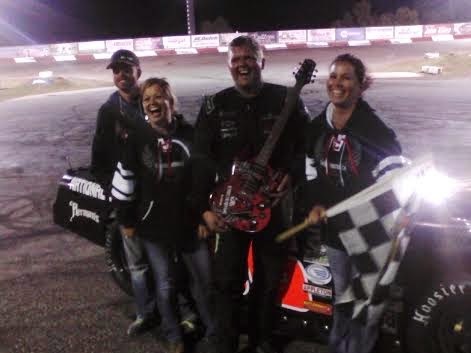 The Power Stock division have been very entertaining this summer at Elko Speedway. The racing has always been good in the Power Stocks but now the weekly car count has increased to over 20 and that has turned up the intensity a notch. Fans have also been treated to a pretty good points race as well with two new rookies in the mix for a Championship. 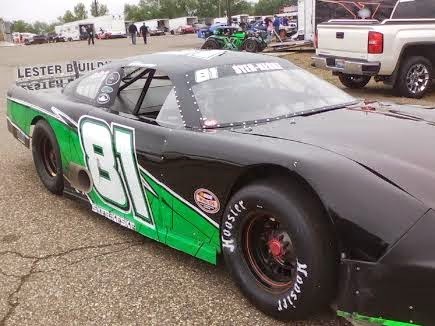 Before this season Nick Oxborough had only raced a couple times in a Mini Stock at Elko Speedway. 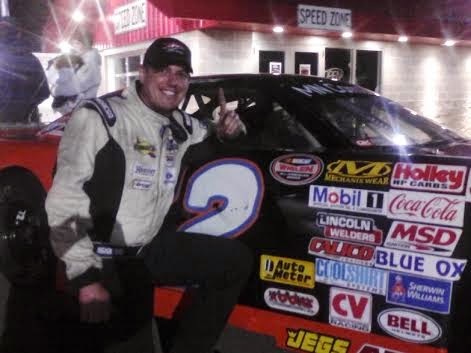 This year Nick won on opening night in the Power Stocks and has held onto a slim point lead each week along with a picking up a couple more wins. "I'm very surprised how well we've done," said Oxborough "I've got to thank my dad and all the pit guys behind me, I couldn't ask for any better help." Fighting for a point title can put a lot of pressure on a race team but the number 88 car seems to remain consistent. 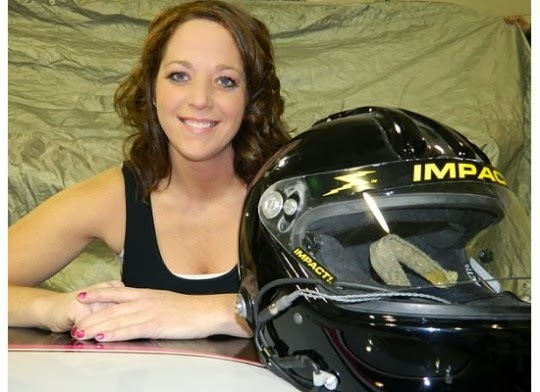 "I'm trying not to think about points as much, because it starts getting in your head," said Oxborough "when I get to the track I try to throw all that out but then on Monday morning I'm back looking at the points!" #14 Grant Brown is another Power Stock rookie in the hunt at the age of just 14. He was the 2012 Bandoleros Champion at Elko and he raced in the Short Tracker division at Raceway park last year. Grant seems to be very calm behind the wheel but also has the intensity needed to fight for the lead in a tough division. "I feel very grateful to be able to run so great in my rookie year" said Brown. "A lot of rookies don't seem to have much experience, so they usually don't have this much success, while next year I will already have been racing for ten years." "I feel especially lucky that I am able to compete against so many strong competitors," said Brown "I am learning new things every Saturday." 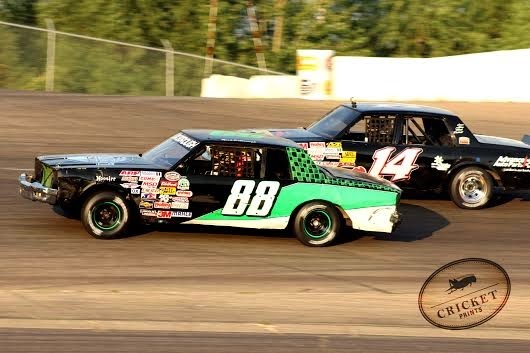 Grant seems to be a very respectful kid who has been taught well by his father Doug Brown who is a four time Champion in the Sportsman/Big 8 division at Elko Speedway. Tom Doten was the "Hard Luck Loser" in a very tight Power Stock point battle last year. Doten lost to John Lebens by only 2 points in 2013 and is still in the hunt this year after recently scoring his first win of the season. Early this season Doten had to race a back-up car for several weeks after crashing their primary car but, now he is back in his familiar #62 and ready to make a run. "If we keep running the way we're running, we've got a shot at it" said Doten. "I have the same feeling as last year, I'm real hungry." Brandon Peterson, Paul Hamilton, Paul Neisius, Shaun Prins, Taylor Goldman, Ryan Varner and Cole Neisius have all won feature events this year too. 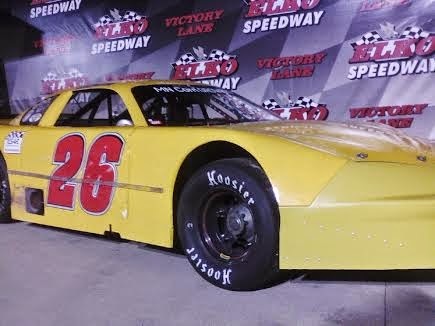 So far, thirty-eight different drivers have earned points this year and that makes for both quantity and quality racing in the Power Stock division at Elko Speedway. The Season Championship in the Power Stock division is this Saturday night September 13th at Elko Speedway. Currently Nick Oxborough has a 4 point lead over Grant Brown with Tom Doten 21 points out of the lead. 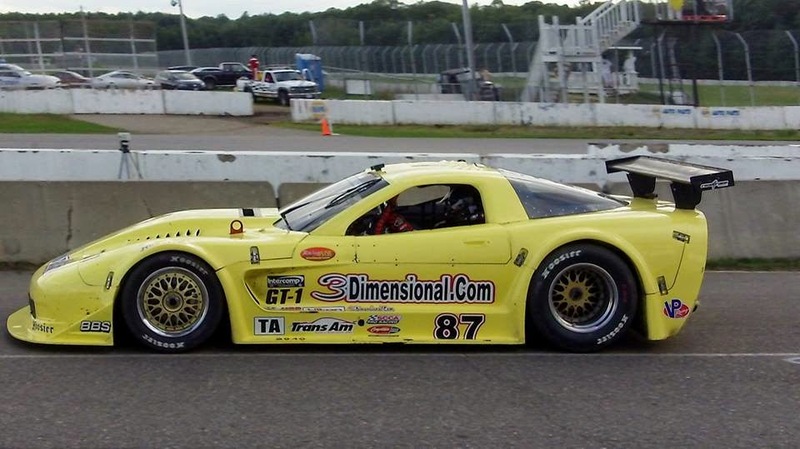 Doug Peterson from Bonita Springs (FL) won the 100 mile Trans-Am series race at Brainerd International Raceway for the second consecutive year, "it was awesome," said Peterson "we were definitely working out there." Peterson started on the pole because rain washed out qualifying and the field was set via point standings. Peterson held that advantage the entire race but it was not a easy win as lapped traffic racing with each other caused some uneasy moments, "I wanted to let them race," said Peterson "we are so much faster then them in the straight away but in the turns we are pretty darn close." With his 5th win of the season in 8 races Peterson extended his point lead to 39 points with only 3 more events on the schedule. 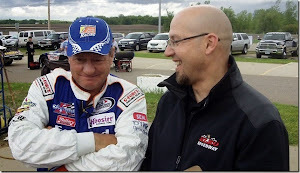 Peterson was impressed with Brainerd International Raceway "Its a great track, it has a lot of heritage, slow speed and high speed and you really have to drive this thing" said Peterson. Amy Ruman from Kent (OH) finished second 7.3 seconds behind Peterson and had a great battle back and forth with Cliff Ebben for the second position. "He seemed to be faster in the corners, we were having a little issue with grip," said Ruman "so I set him up out of (corner) 13 and got a good run down the straight away and passed him back." Ruman moved back into the second position in the point standings with her runner up finish, "with all our bad luck lately, I'll take the second" said Ruman. Cliff Ebben finished third only 1 second behind Ruman. Simon Gregg finished 4th and he was 36 seconds behind Peterson at the finish line in this caution free race. The 40 lap race took only 1 hour and 2 minutes to complete the 100 miles with and average speed of 96.277 mph. 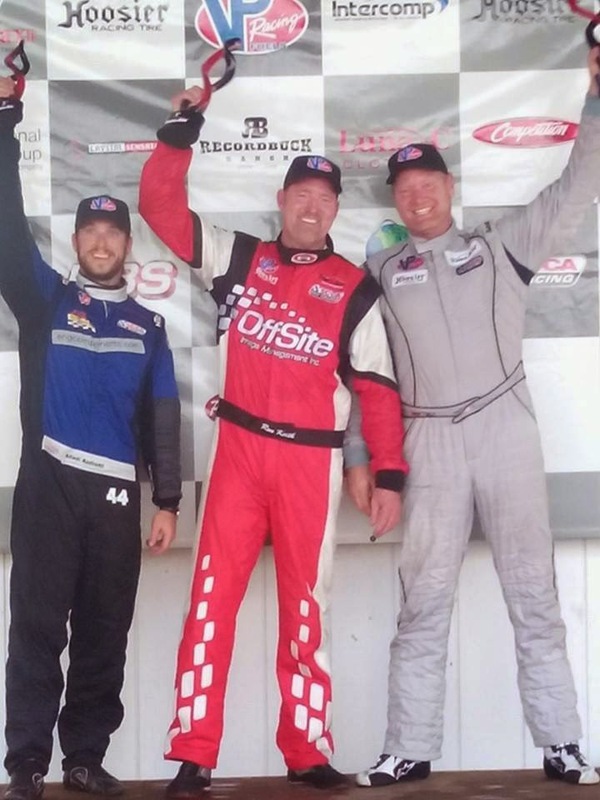 Ron Keith (middle) from Shawnee (KS) won the TA2 division finishing just ahead of a hard charging Tommy Kendall (right) for the win, Adam Andretti (left) made it to the podium with a third place finish. Jerry Greene from Minnetonka (MN) won the TA3 division. 29 cars competed in this event and that is the largest number of cars since Trans-Am returned to BIR in 2010 and there was a noticeably larger crowd of spectators for this event than previous years. 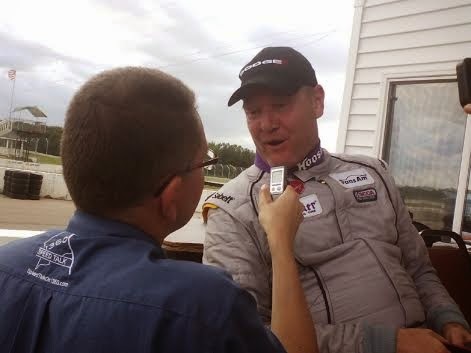 Speed Talk on 1360 Radio will broadcast interviews with Trans-Am drivers Doug Peterson and Amy Ruman and also post race interviews with Tommy Kendall and Ron Keith on Saturday September 6th between 10-11am while we are on-location at the Classics by the Lake car show in Buffalo. #54 Sam Hornish Jr and Ryan Blaney battled for the top spot all day long during the Get to Know Newton 250 Nationwide series race at Iowa Speedway. Hornish lead a total of four times for 167 laps and Blaney held the top spot five times for a total of 80 laps. 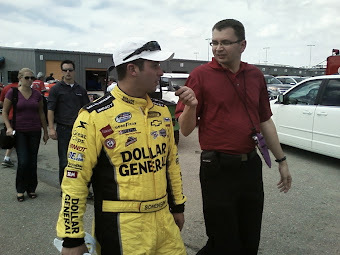 Hornish driving in a part time role for Joe Gibbs Racing took the lead for the final time after a restart with 20 laps to go, Blaney was the leader and chose the bottom side but Hornish had the faster short run car and won by .796 seconds. Regan Smith was aggressive after the final restart and moved up to third with Chase Elliott and Elliott Sadler round out the top 5 with Brian Scott finishing 6th. 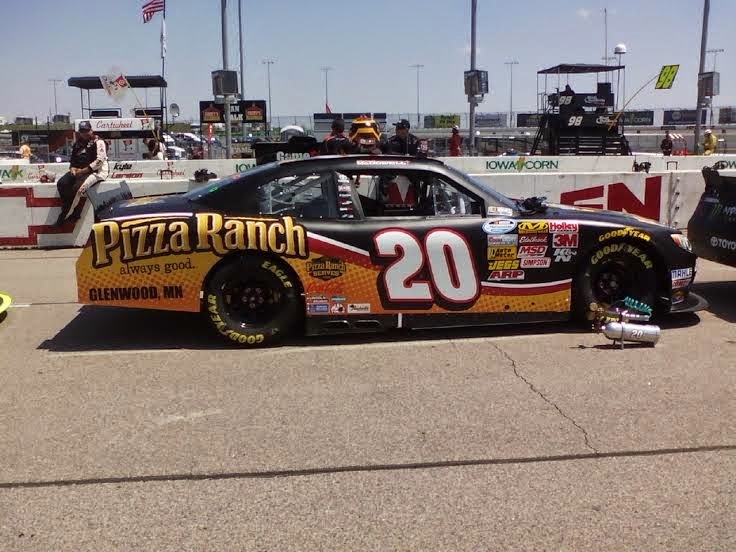 #20 Michael McDowell driving the Glenwood MN Pizza Ranch sponsored car was a top 10 car throughout but took a chance with only two new tires on a restart with 38 laps remaining in the race. He exited the pits with the lead but faded back to finish in the 7th position. 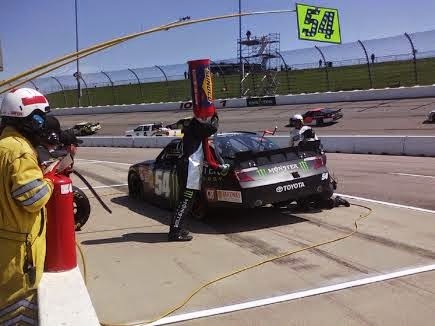 Ty Dillon and Trevor Bayne finished 8th and 9th, they ran nose to tail the entire day. "We had no short run speed," said Bayne "the race didn't play out the way we needed it to, we needed some 75 lap runs to make some ground up, but everything was short run." Hometown hero Landon Cassill pleased the crowd with a Top 10 finish, "It was a solid race for us, just track position was really important, it was really hard to pass." The 250 lap race saw only 5 caution flags and the only wreck was for Mike Bliss on lap 222. 18 cars finished on the lead lap and the race took 2 hours and 4 minutes to complete. 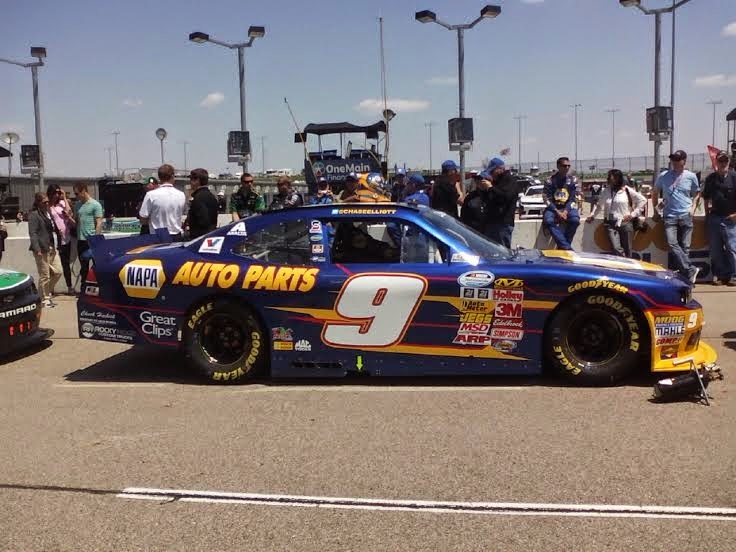 #9 Chase Elliott leaves Iowa with the Nationwide Series point lead by just 2 points over both Elliott Sadler and Regan Smith. 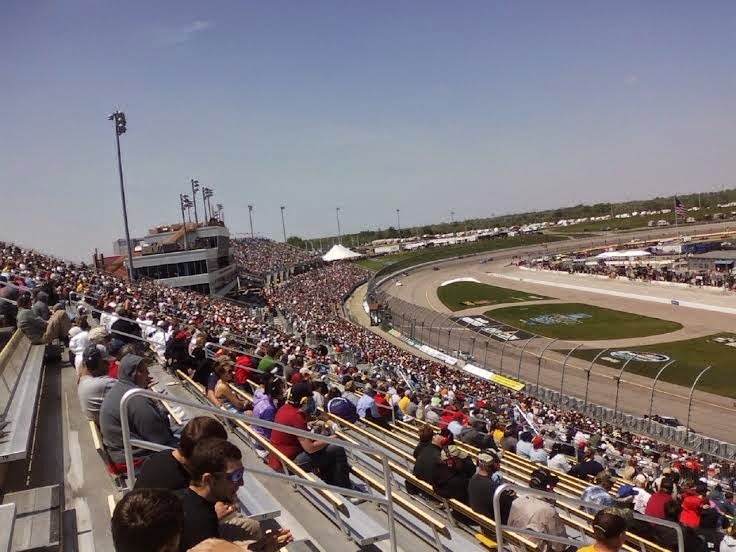 The patching of the track surface to repair some harsh winter damage was apparently a success, drivers noted they did not have a problem with any of the patches and it was hardly noticeable compared to last year.